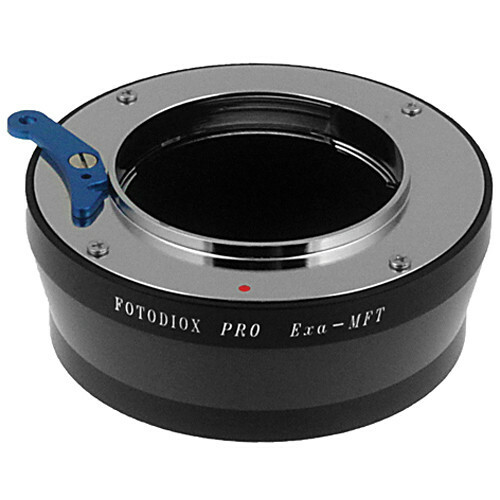 The Fotodiox Exakta/Auto Topcon Pro Lens Adapter for Micro Four Thirds Cameras is a high quality adapter that allows you to mount a Exakta/Auto Topcon mount lens to a Micro Four Thirds camera body. It features a brass construction with a stainless steel finish as well as the ability to focus to infinity. This works with a leaf spring system for a secure attachment. This adapter will not allow for electronic control over lens functions. In order to function with automatic metering you will need to place the camera in manual or aperture priority mode, where the camera will utilize stop-down metering to determine the appropriate shutter speed. Box Dimensions (LxWxH) 2.9 x 2.9 x 1.2"
Exakta/Auto Topcon Pro Lens Adapter for Micro Four Thirds Cameras is rated 5.0 out of 5 by 2. Rated 5 out of 5 by birdman from It Actually works! For some reason, Exakta adapters for m4/3 seem tough to make. I've tried several in the under $30 range, and had to send them all back. Not true for Leica or OM adapters. This one is nicely made, tight (but not too tight) at both ends, and allows me to use the sensational Topcon lemses on my E-M1. Rated 5 out of 5 by Wes from Works great! Bought to use with an old Meyer-Optik Grlitz 50mm f/2.9 trioplan and my micro four thirds camera. Was slightly worried about the Exakta mount not working properly but it snapped into place immediately! MFT mount fits snugly too. I shouldn't have expected anything less from Fotodiox, they make great stuff.